I stopped by Zingerman’s in Ann Arbor yesterday. I had an excellent bowl of matzo ball soup while I gathered my wits. What a place, very busy with people, sights, and sounds. I’m glad its not the 60’s and 70’s or my mind would have been way overwhelmed with all of the colors, sounds, and smells. I must also their company training program for the staff should be a model for all retail establishments. I never asked for a sample but was offered multiple samples of many great items. I had knowledgeable and friendly conversations 9 different employees during my time there. All were smiling, upbeat, and dedicated to pleasing the customers. I had a great time while there. 1 Cinnamon roll, 1 hot cocoa coffeecake,1 sour cream coffeecake, and 4 brownies. It took 4 of the yellow shopping bags and two trips to get it to the car. Wow. I'm visiting my mom in Michigan in a couple of weeks, and we were planning on visiting Zingerman's. Looks like I need to take an empty suitcase -- or leave my wallet at home. Bruce, I am envious. Since my first and only trip to Ann Arbor for the Longone Center Dedication, I have had all of Zingerman's outlets on the brain. I agree that they do a terrific job drawing the customer into the experience. It's a top-notch business model based on enthusiasm for real food. Did you happen to get to the Roadhouse? Josephine wrote: Did you happen to get to the Roadhouse? No, I spent way too much time in the deli. I do want to go sometime. Ann Arbor would be a nice road/shopping trip this spring. Bruce wrote: No, I spent way too much time in the deli. It's debatable whether that is possible. I recall a strong sense of frustration because I went late in the day and didn't have enough time to scrutinize their offerings. Slow and steady wins the race! Just got back from Michigan (a day late, due to the snow). The visit to Zingerman's Roadhouse was a real treat. Everything on the menu looks incredible, with the best possible ingredients in everything, as one might assume. Even the bread and butter put on the table were outstanding. And the service is exceptionally good. My mom had an open-faced crab sandwich and I had the Roadhouse Reuben, made with peppered ham instead of corned beef. Both were excellent. The double-cooked fries were dark and crisp. The caesar salad dressing was perfect (salad with crab, fries with Reuben). We were too full for dessert, but because we'd never had their famous donuts before, our waitress brought us a small container of donut holes to take home. There is a small selection of books available for sale, as well, at the restaurant -- cookbooks and treatises on olive oil and service. There was also a reproduction of a Buckeye Cookbook from the 1800s for $17, but when I asked if it was somehow connected to the nearby Longone Library, the waitress had no idea. Also made a quick visit to the deli, but people were packed in so tight (it was a Saturday) that all I could really do was smile admiringly at everything, try one sample of olive oil, and then head for the door. It would have taken the whole afternoon to get even halfway into the jammed space, and my mom was circling the block, as there was also no parking -- so not an optimum visit. But it looked impressive, and I can imagine trying to get back on a non-weekend day. But as for the Roadhouse, I recommend it to any and all who get to Ann Arbor. Last weekend was the Symposium on American Culinary History in Ann Arbor. Zingerman's had a presence throughout the program enthusiastically represented by co-owner Ari Weinzweig. When I arrived to Ann Arbor, I had just enough time for lunch at Zingerman's Deli. I selected two Niman Ranch pastrami Reuben sandwiches in regular and larger for Mom and I. I learned later regular was 4 ounces of meat and larger was 6 ounces. While pricey (2 sandwiches, 2 drinks and fruit salad just under $40) and despite the cheese never quite melting, it was one fabulous full flavored sandwich. Zingerman's catered Saturday's lunch with lots of interesting sandwich combinations featuring Wisconsin cheeses. On Sunday there was a brunch at Zingerman's. 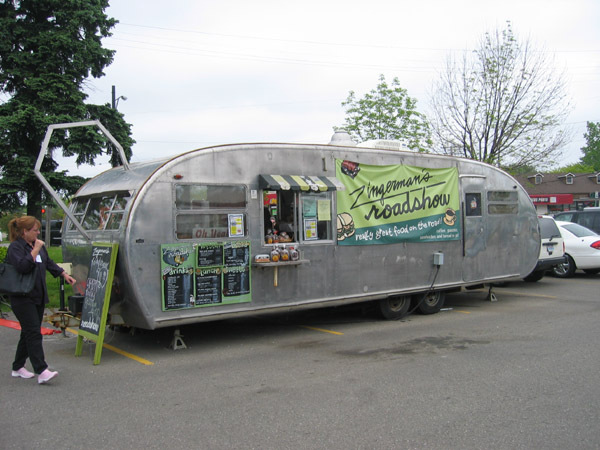 The visit began by checking out a Spartan stainless steel trailer home, purchased on e-Bay, acting as drive-up food and coffee service depot called The Roadshow. Roadshow offered samples of Rhode Island milk coffee. This drink is very regional and not universally known. The first time I learned of coffee milk was when Erik M gave me a bottle Autocrat Coffee Syrup his Mother had shipped in special. The second time was at Zingerman's. Instead of buying a prepared coffee syrup, Zingerman's makes their own: They make double strength of their 'Roadhouse Joe Coffee,' then reduce by half, equating to quadruple strength coffee, then add sugar to make the syrup. Their made on the premises coffee syrup is diluted with milk when served. Brunch was a plated sampler plate of interesting breakfast foods. I was quite relieved it was a sampler, because the menu originally presented seemed to suggest they were choices. Very difficult choices to make when everything I was eager to try. 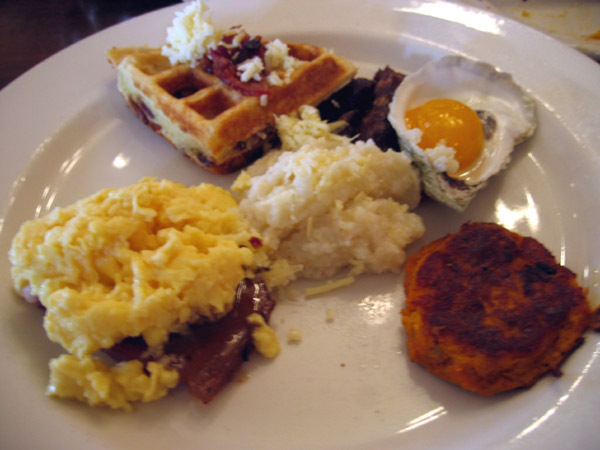 Going clockwise: oyster poached egg on top of oyster hash; Sweet potato and pecan pancake; scrambled local cage-free eggs over Newcom's country ham and redeye gravy; grits and bits waffle and in the center Anson Mills grits. Passed around family style was John Cope's cream corn made with dried sweet corn. There was a bread basket filled with fresh doughnuts, buttermilk biscuits, rye and sourdough breads. To accompany these breads they had American spoon preserves, sorghum syrup, maple syrup and butter. They recommended making a paste of the sorghum and butter, then applying to your bread. There were tours of Zingerman's creamery featuring an extended conversation with the cheese craftsman who was happy to explain everything. The subtle seasonal adjustments were interesting: 5-gallon buckets of processing cheese could not rest on the floor in winter. The colder winter floors impede processing, so they rest on platforms instead. Visiting their bakery, they also commented on seasonal adjustments in water temperature introduced to their bread dough: in summer it is chilled to 38 degrees in winter it is warmed to 68 degrees. These seasonal adjustments help modulate the proofing times. The bakery has a 50-ton brick oven built by a Frenchman taking several weeks to complete. These are very deep ovens requiring long handled paddles to move bread around. I have a small film clip of their loading process I think you will find interesting: loading brick oven. The breads are evaluated by touch and thumping to determine doneness. The tours and brunch took hours to complete, though it was well worth the time invested. Cathy2 wrote: Zingerman's had a presence throughout the program enthusiastically represented by co-owner Ari Weinzweig. I spent a long weekend in A2 last summer and was extremely impressed by Ari and the entire Zingerman's operation. I especially enjoyed the original deli, where the offerings -- while pricey, as you said -- were outstanding. 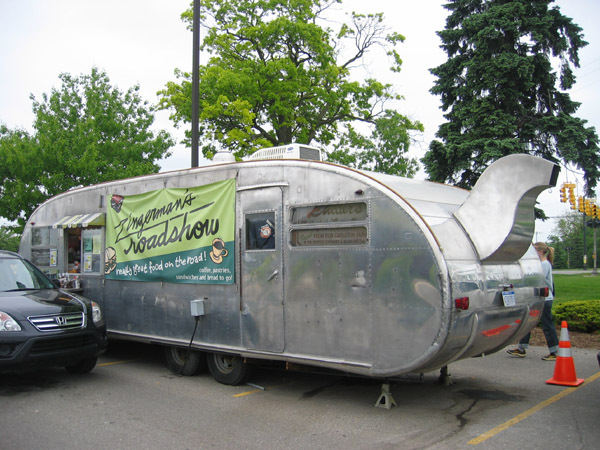 I loved the concept of the Roadhouse even though some of the items I tasted at my breakfast there, were just ok.
Aside from Zingerman's, A2 is a decent food destination in its own right. We had a nice dinner at Bella Ciao and the Saturday, Kerrytown Farmers Market -- at which we shopped for a group meal we cooked later that day -- was terrific. The fishmonger inside the Kerrytown mall, Monahan's Seafood Market, not only sold high-quality, very fresh fish and seafood but also cooked us a wonderful lunch at their counter -- using only items from their case, the market and shops -- that was inventive and extremely delicious. I'm sure pretty much everyone who goes to Zingerman's for the first time says this, but for a place with such a large culinary footprint, the store is small verging on tiny, and packed so tightly with foodstuffs one more ounce of corned beef or loaf of bread may cause the building to explode. I picked up a few items, fresh made in-house mozzarella, Spanish chorizo, finocchiona and a tart chunky orange marmalade that goes perfectly with good butter and Zingerman's pumpernickel. Speaking of Zingernam's bread, I was absolutely blown away by the bread, in particular the pumpernickel. Crusty, dark, rich intense, yet with a lightness, in comparison to German style, characteristic of Jewish style pumpernickel. The four of us bought sandwiches, smoked salmon on pumpernickel with red onion, tomato with butter,* ruben, corned beef and a daily special Fireball, pulled pork, horseradish, hot peppers, pepper jack cheese and onions. Taking Ann Fisher's advice** from this thread we walked over to Durham's Tracklements only to find it, as we expected on a Sunday, closed. Durham's, right around the corner from Zingerman's, has according to both Marion Burros and, more importantly, Ann Fisher, the best smoked salmon available. Echoing both Ronnie_Suburban and Cathy upthread, I found Zingerman's quality excellent, but thought the pricing, across the board, on the high side. *It's the #17, I subbed butter for cream cheese. Durham's Tracklements is indeed the Real Deal. Durham is incredibly nice and passionate about his craft. Best smoked fish and meat I've ever had. He also does mail order. Everyone knows about Zingerman's. It's long been a destination, too much for it's own good, I think. Food is wonderful. The prices out of out this world. The staff, in my opinion, can be a little overbearing. When I lived in AA I weaned myself off of Zingerman's in favor of Morgan and York's. They have a cured meat and cheese counter that I think is better than Zingerman's and have an incredibly good wine, spirits, and beer selection. Their selection of olive oils, vinegars, and canned goods isn't as extensive as Zingerman's, and they don't do nearly as much prepared food (i.e. sandwiches). It's also much less crowded and the staff is much more personable. G Wiv wrote: tart chunky orange marmalade that goes perfectly with good butter and Zingerman's pumpernickel. Perfectly is a bit of an understatement. The first thing that struck me about Zingerman's were the prices...they were astronomical! As students (10 years ago, mind you), my friends & I used to hit Zingerman's once a month or so for a sandwich & a soda, and used to be out the door in around $8...we even considered that to be a bit high, which is why we didn't go more often. But yesterday, my wife & I got 2 sandwiches ("nosher", or small portions), a sparkling water, and a Doc Brown's Cel-Ray: $30.18! After lunch we perused the olive oil selection, but found that most of the 500ml bottles cost $30 or more. They had jamón ibérico de bellota, which I was pretty pumped about...$15/oz or, if you want 1/2lb or more, $200/lb. Nueske's applewood smoked bacon was $12.99/lb...I bought it from Paulina Meat Market a few weeks ago for $7ish/lb, and saw it at Fox & Obel for right around $10/lb. In the end my wife bought a small lemon poppyseed coffeecake for $12.99, which I guess isn't too bad, and we also picked up two small loaves of pretzel bread for a buck apiece (which is actually pretty good...same price as Trader Joe's). The Zingerman's catalog made their in-store prices seem reasonable: the small $13 coffeecake costs $24, plus $12 shipping. A reuben-sandwich-for-two kit costs $85, plus $36 shipping (unless you order it between May & September, then it's $45 delivery). The prices make Whole Foods and Fox & Obel seem as cheap as Aldi! I guess kids have a lot more cash in their pockets than they did 10 years ago, because the place was jam-packed with students scarfing down $20 lunches. That said, the sandwiches were delicious, and the staff couldn't have been more helpful & pleasant...the girl at the deli counter happily shaved a piece of the jamón iberico off the leg for me to sample after she saw me staring at it, chatted with me about the new FDA regulations pertaining to the hoof, and then actually dissuaded me from buying any after I said it would be in the car for 4 hours and probably wouldn't eat it the same day - gotta love when employees are honest straight shooters, instead of just trying to sell, sell, sell. However, the sticker shock was severe enough that I get the feeling we won't be jumping off M-4 the next time we pass by in the future. Khaopaat wrote: The first thing that struck me about Zingerman's were the prices...they were astronomical! I moved back to Chicago from A2 18 years ago and, I agree, the prices have reached jaw dropping levels. Even then, I had to save from each pay check to be able to eat there a couple of times a month and this was before the Roadhouse and the Bakehouse and such! That being said, I'm a sucker for their whitefish salad and the #43, the S. Muno's Montreal Reuben, and am compelled to stop in for them on the rare occasions I'm in Ann Arbor. 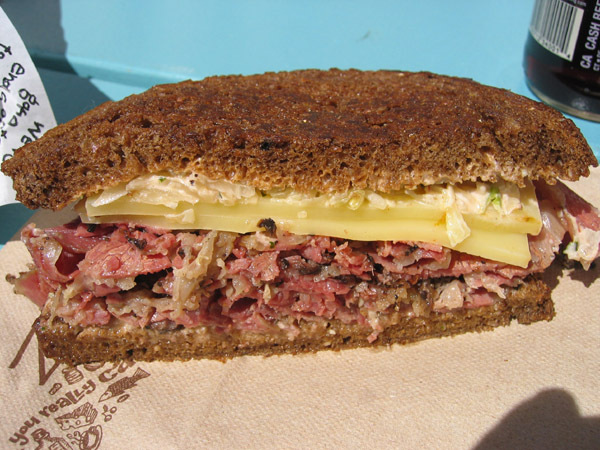 Does anyone know of a local source for Montreal Smoked Meat? I've never seen it in Chicago, but would love to be able to satisfy my MSM craving locally. Does anyone know of a local source for Montreal Smoked Meat? I don't quite have an answer to your question but I'm curious how Hopleaf's Montreal Brisket would compare. It was a typical Wednesday morning at Zingerman’s Roadhouse, a restaurant in Ann Arbor, Mich., that offers nine varieties of macaroni and cheese and smokes its own hogs for pulled pork. But on this particular morning, in a colorful back dining room, finance was on the menu. Was up in Ann Arbor a couple weekends ago. Stopped by Zingerman's Deli for a pastrami/corned beef sandwich and the spicy Cuban. While I enjoyed the pastrami/corned beef, I only at a few bites & saved it for later. The spicy Cuban was the bomb, incredible sandwich. Also picked up some super aromatic whole black peppercorns from India as well as some fennel pollen. Both are terrific, have been used quite a bit the past couple weeks. G Wiv wrote: Taking Ann Fisher's advice** from this thread we walked over to Durham's Tracklements only to find it, as we expected on a Sunday, closed. Durham's, right around the corner from Zingerman's, has according to both Marion Burros and, more importantly, Ann Fisher, the best smoked salmon available. Thanks for reposting this Gary and after just"another" smoked salmon bagel this morning, I just might have to agree with Ann, I've been blown away at how good the salmon is. I was the only one in the store and had the good fortune to run into the owner of Durham's Tracklements, TR. Great conversation about a myriad of topics. Sweet Willie wrote: Was up in Ann Arbor a couple weekends ago. Stopped by Zingerman's Deli for a pastrami/corned beef sandwich and the spicy Cuban. While I enjoyed the pastrami/corned beef, I only at a few bites & saved it for later. The spicy Cuban was the bomb, incredible sandwich. I’m planning a trip to A2 and Detroit in the next couple of weeks. What day of the week did you find Durham’s Tracklements open? Are there any updated hours? I'm a big fan of Durham's Tracklements and fondly remember good conversations about fish with T.R. Note they also ship fish. stevez wrote: What day of the week did you find Durham’s Tracklements open? Are there any updated hours? Darren72 wrote: Note they also ship fish. Thanks for the info. This is shaping up to be a great trip. We have good friends who live in Ann Arbor and visit them often. Their son worked off and on at both Zingerman's and Tracklements for several years, and even had his eponymous "Pete's Bacon" in the case there for a couple of years before he moved to Denver. In addition to the fish (and bacon), they always have some interesting pickles that one of the staff members (can't remember her name) makes....we had pickled apples last fall that were outstanding. It makes for a great morning of noshing, especially when combined with a visit to the Kerrytown farmer's market -- just around the corner. In addition to Zingerman’s and Tracklements, I’d definitely suggest going into the main shops in kerrytown mall and stopping by Monahan’s fish market. the smoked fish from Durham's Tracklements has been sublime. The only item I haven't liked is the smoked trout salad, as there are so many onions & red peppers that overwhelm the delicate flavor of the trout, just not a good ratio/mix. In addition to Zingerman's Deli, if you have a little time, there is something of a Zingerman's "strip mall" in Ann Arbor, where there are three consecutive Zingerman's stores: Coffee Roastery, Creamery, Bakery. All are worthwhile -- and if you're spending the night nearby, know that the Bakery also offers classes. All three are glorious, but the creamery was a standout for me simply because, in addition to offering a variety of local cheeses, they also had pawpaw ice cream. Had always heard of pawpaws, but finally found out what they taste like.